Kids' Book Review: The Reading Hour is here! The Reading Hour is here! It's The Reading Hour! Tonight, between 6 and 7pm, why not snuggle up on the couch with a mountain of books and get reading with the kids? It's probably one of the best ways we can think of to pass an hour--we hope you'll join us! 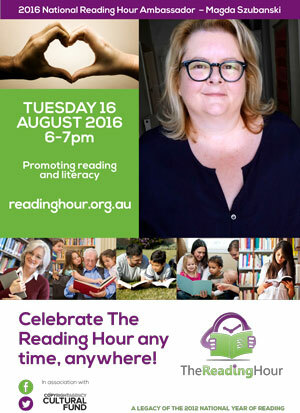 National Ambassador Magda Szubanski will be reading up a storm, too. Learn more at www.readinghour.org.au.